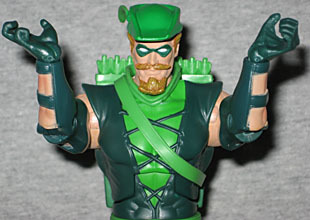 When asked, point blank, if Mattel would ever up their level of articulation to Marvel Legends standards (ie, double-hinged elbows and knees), Toy Guru said they'd do it for characters who warranted the change, naming Green Arrow as a specific example. This was before Series 3 was released, and in Series 9, we finally got GA. Does he live up to the promise made a year prior? Let's find out! Don't most heroes fight for the "innocent and downtrodden?" It's only Congressmen who go to bat for the guilty and well-to-do. Of course, Green Arrow is known as the wildly liberal superhero, so that's probably what they're hinting at. Yes, yes, I know pretty much all superheroes have liberal values - that whole "willing to help people who need it" thing is a dead giveaway - but GA is beyond the norm, a guy who would even make Keith Olberman look like a Fox News shill. Considering DCU's reputation as a line built around only two sculpts, you'll probably be shocked by how many new parts this figure has. New feet, new shins, new torso (upper and lower), new hands, new forearms, new biceps... the shoulders, groin and thighs may be reused - may be - but that's it. His costume elements are sculpted on, not just painted, so he ends up one of the best-looking DCU figures yet. The laces across his chest, the edges of his arm-guard gloves, the tops of his boots... all sculpted. 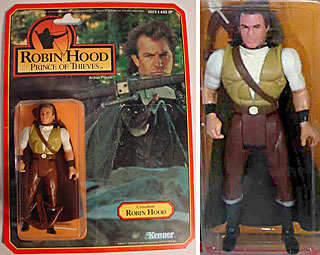 He's even got the silly G belt buckle that showed up on Kevin Costner's Robin Hood toy after Kenner famously reused their Super Powers [and even some Star Wars! --ed.] molds to piece together their Prince of Thieves line. Yeah, that's right, Mattel isn't the first company to be stunningly tight-fisted and cut corners to the point of ridiculousness. Is your mind blown, haters? 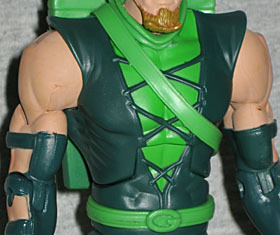 Ollie has a loose collar bunched around his neck, a non-removable quiver full of non-removable arrows, and a separate strap around his chest. 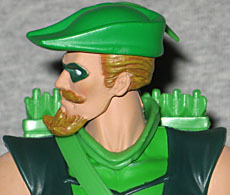 The head is new, of course, because there is no way any other figure on the face of God's green Earth could ever be easily repainted into Ollie Queen. Even if there was a DCU Classics Travis Morgan, he wouldn't have the right kind of hat. His beard and mustache stick out from the face appropriately, and his mask actually provides some cover for the eyes - Alex Ross should take notes. The feather on his cap is detailed right down to the vanes, and the sculpt takes into account the way the thing would attach to a real hat. Lovely work! Okay, so, the articulation. For the most part, it's the DCU standards: swivel ankles, hinged knees, swivel thighs, hinge/swivel hips, swivel waist, hinged torso, and joints at the wrists, elbows, biceps, shoulders and neck. If you've ever touched a DCU figure, you know the score by now. However, there have been changes. For instance, the head: beginning with DCU9, Mattel inexplicably changed the construction of their neck joints; instead of a standard barbell-style balljoint, with a ball in the head and one in the neck connected by a single cylinder, they've switched to a "double barbell," which goes ball-cylinder-ball-cylinder-ball; the second ball rests farther down inside the chest, and effectively locks the head in place, turning a balljoint into a plain swivel. This is really badly done, Mattel. It means GA can only look side-to-side, not up and down. And now, the $24,000 question: how are the arms? The good news is that, just as promised, we get new articulation! Hey, all right! Ah, but this is Mattel, the company that never met a good idea they couldn't do wrong. The new joints are in the wrists; instead of swivels, we have swivel/hinges, so effectively the same as a Hasbro balljoint wrist. Which would be fine, if you used your wrists at all to fire a bow! In fact, in archery, the stiffer you hold your wrists, the better your shot will be. We've given a complete lesson on proper archery poses before, and while this figure is definitely better than the DCD figure, the choice to make balljointed wrists is a foolish, amateur move. Mattel was already molding entirely new arms - they couldn't have at least put a double-hinge in the right arm, so he could get his hand up to his cheek? You know, a professional's anchor point? The one that allows them to sight down the arrow? Yeah, that. So basically, Mattel shorted us on the one joint we needed most in order to give us the two we needed least. It's things like this that make the fan community think Mattel is purposely trying to do things wrong. Of course, maybe screwing up the arms was an intentional effort to disguise the figure's other major shortcoming: his accessories. He comes with his bow, obviously, because anyone who'd release an archer without his equipment would be... remarkably stupid. Sadly, the bowstring is plastic, molded as part of the accessory, and there's an arrow permanently attached, making the bow pretty much useless for both play and display purposes. 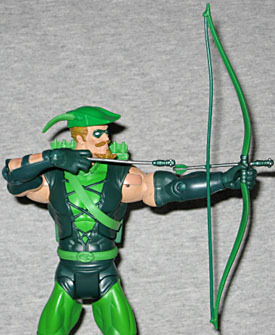 Beyond the bow, Green Arrow includes four loose arrows, each with a different kind of gimmick. 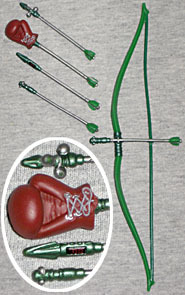 There's a bola arrow with three balls (making it a boleadora) ready to unspool, and nicely sculpted cords wrapped around the arrowhead; the classic boxing glove arrow, which gets individual paint apps for the gloves, grommets and laces; an explosive timer arrow, with a fully painted digital readout; and an explosive impact arrow, same as the one locked onto the bow. They're all very nice accessories, but they all share the same unignorable flaw: they're too damn short. Pretend you're firing a bow: how long would the arrow need to be? At least as long as your arm, right? Plus a little more to reach your lip or cheek? Exactly. These arrows barely reach Ollie's elbow. They're about half as long as they should be, and it's true for every single one of them. Again, an avoidable move that shows a lack of forethought. I'd rather have real-length arrows than ones that look like they can fit in the short quiver any day. Yes, the quiver is accurate to the comic art, but art can cheat and plastic can't. Not good enough. Green Arrow doesn't include a piece for this series' BAF, Chemo. Instead, like Flash, he gets nothing but a clear plastic display stand. Some people were annoyed by this, but come on: it's Green Arrow! He's famous enough to sell on his own. He doesn't need a BAF piece to help him move, not the way a guy like Guardian does. This figure has some clear mistakes in execution, but his design is great and he's still the best GA figure available. I wish Mattel had been smarter when they were putting this one together, but when is that not the case? For all our complaints, when it comes to DCU Classics, Green Arrow is actually above average.